On the ridge below Electric Peak, 13,598 ft.
We’ve always insisted that some of the easiest peaks can present the biggest challenges. 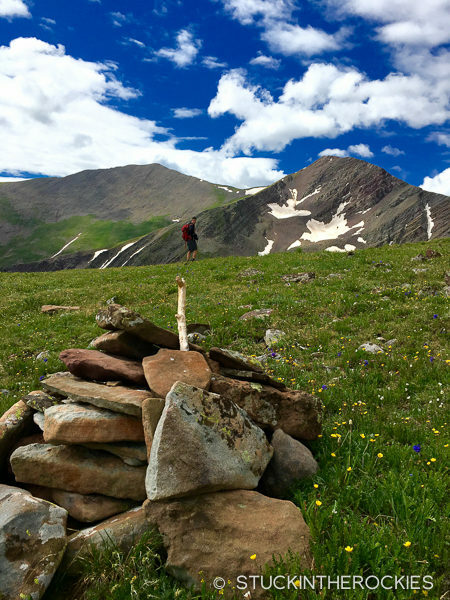 We had twice failed to reach the grassy summit of Electric Peak, 13,598 ft. in the Northern Sangre de Cristo Mountains. Once in the fall it was due to unexpected snow and the second time, in summer, was due to intense rain. The third time was the charm. But it was still kind of close. 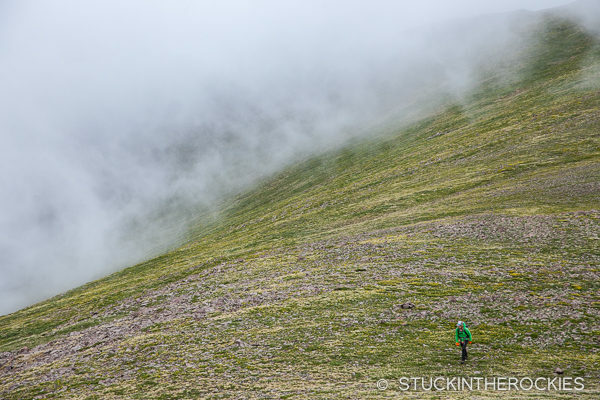 For a few years now we’ve been exploring the peaks and valleys of the Northern Sangres. 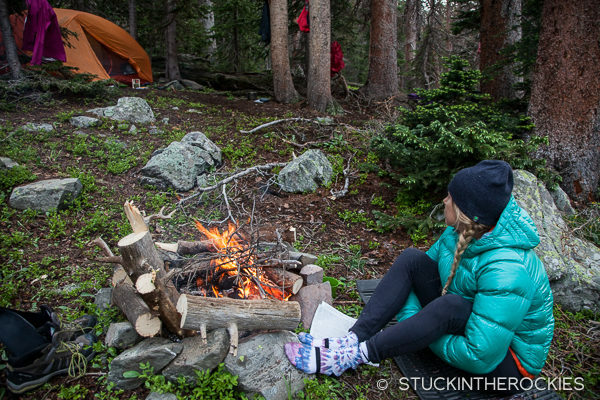 We find the trails to be good, there are beautiful lakes right at treeline for camping, and we see more wildlife than in any other range in the state which is likely due to this last attribute— there are no people. It’s virtually empty. On the way in. The forecast called for weather and that’s what we got. The flowers were going off. 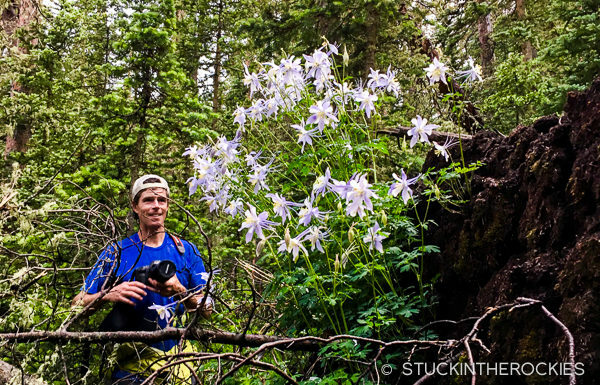 We found a stand of columbines denser than we had ever seen before. Sorry if we’re spoiling the secret quiet spot in the state, but it has to be shared. 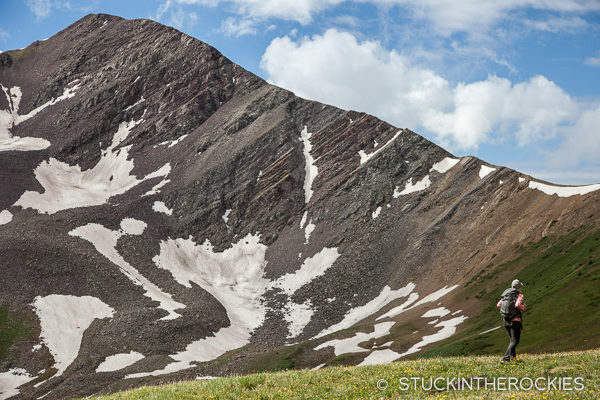 Besides, there’s so much room and since there are no 14ers in the vicinity, I doubt it will ever change. 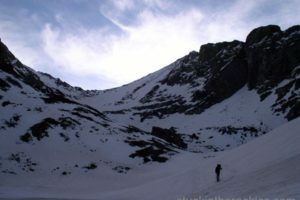 So last weekend we headed in towards Brush Lakes to try again for one peak that continued to elude us. Brush Lakes is actually two large lakes and a third smaller one, and the approach is only about 3.5 miles if you drive to the high trailhead. 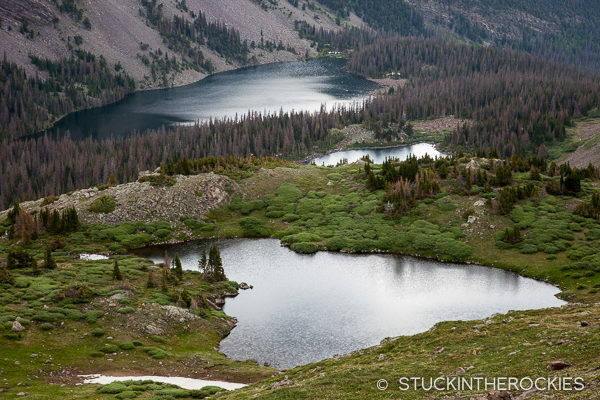 From there, four named 13,000 foot peaks frame the lakes. It’s a really cool setting. On the way up to Electric Peak, the taller summit in the back-left of the photo. It was a pretty day to be up high. 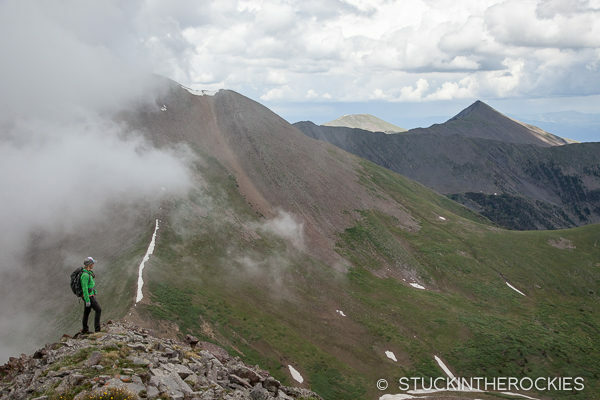 Once on the ridge, a place we had been before, the clouds kept rolling around the west side, slowly building. 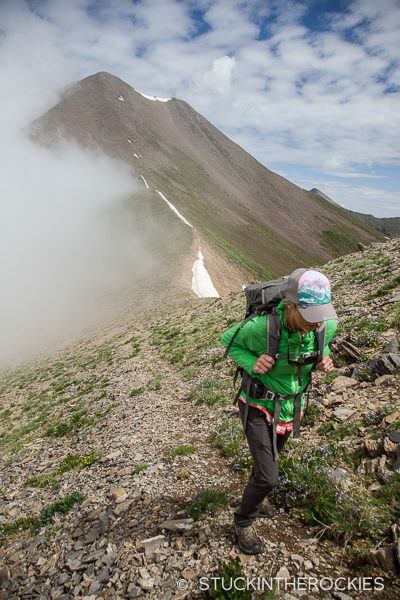 It was our first summer backpack in a while, so as we headed up on the gorgeous morning towards Electric Peak, Christy was in full naturalist mode. Wildflower book in hand, birding binoculars around her neck, we took our time hiking the high alpine grassy slopes and just took it all in. 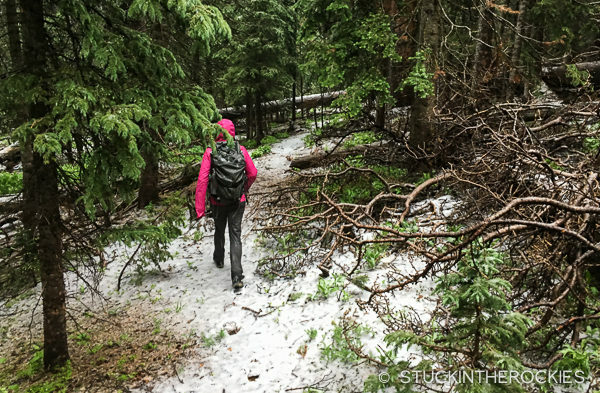 The weather forecast wasn’t great though so at one point I had to insist we take a time-out on the naturalist session and get going to the summit. It was a good call. 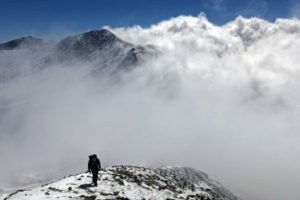 As we reached the ridge, a place we had been forced back from before, the clouds were building to the west. It made for some dramatic photos for sure, but also served as a reminder that eventually they would grow and change from being benign and pretty to something more threatening, or worse. It was kind of surreal for a while, but we knew eventually it would change and feel less friendly. The three Brush Lakes as seen from above. And just as expected, after finally reaching the summit and heading down, the storm rolled in. Thankfully we were below treeline when the thunder and lightning ramped up. 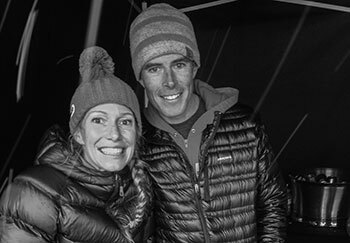 By the time we reached the tent, two inches of hail had accumulated on the ground and we were completely soaked through and shivering. A wave of hail approaches. You wouldn’t think it was July 3rd. Warming up after. It took a few hours for the hail to melt and allow us to collect enough dry wood to build a fire. 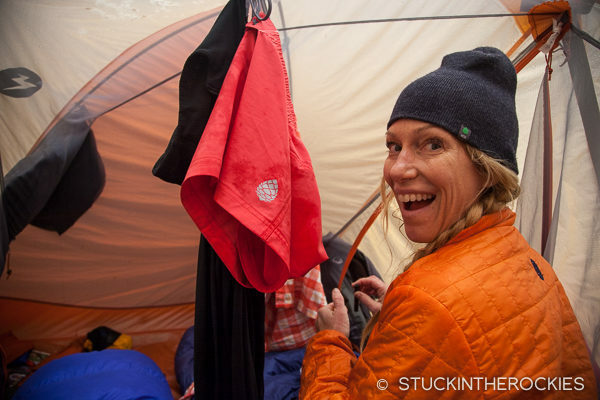 We piled into the tent, wet clothing and all and spent the remainder of the day and night drying out and warming up. Had the timing been a little different, we may have missed Electric again. But instead, we got the full experience. 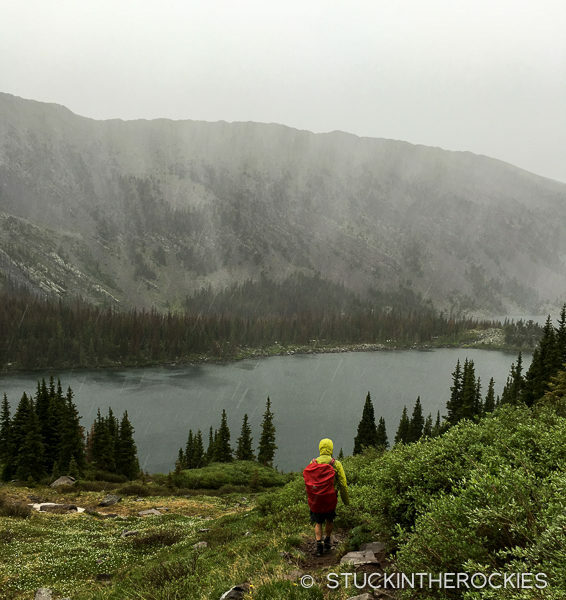 Brush Lakes and Electric Peak were pretty memorable. 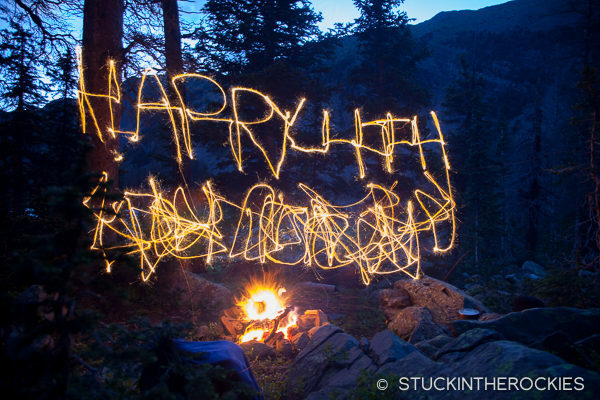 Some pre-4th of July sparkler fun at the campfire. The next morning was a bit more dry. We just relaxed by the lake with a few cups of coffee. It was time to pack up and head down. Nice! Fun to finally get it done. Hopefully it’ll be a while before that area is too crowded, it’s just too far out of the way from most of Colorado. When I was at Brush Creek I think there were three groups of people the whole time. There was a huge amount of deadfall from some windstorm that hadn’t been cleared, and weeds were growing on the trail. 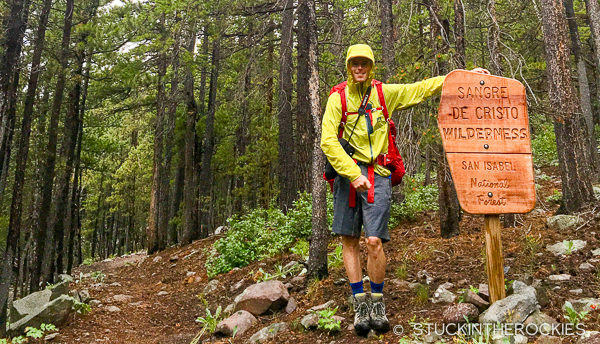 I don’t know about you, but I have an informal project to run all the Sangres trails, just to get me to explore the range. I’ve made pretty good progress on the north and Crestone area east and west (town has a nice brewpub now). It’s definitely got a wilderness feel because of the lower traffic. 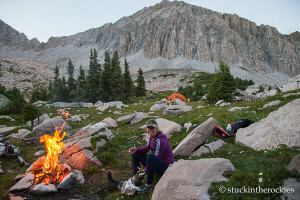 I do have some trouble with summiting because I do the drive and run the approach beforehand, and my alpine start isn’t the greatest : ) Need to start camping. 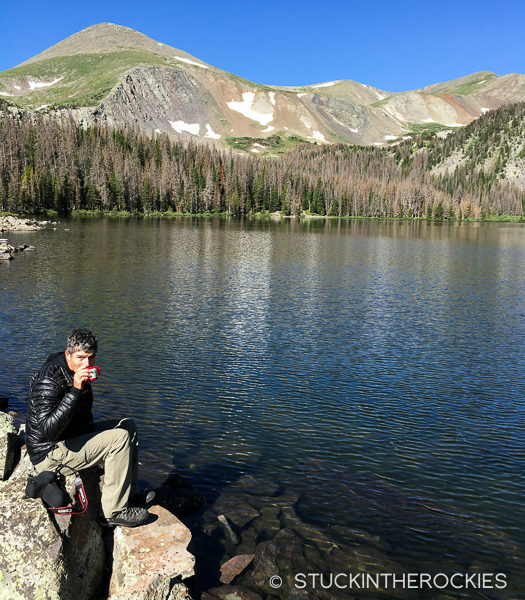 Brewpub in Crestone? Or Westcliffe? We had a blast, a route has been cut through the deadfall but it looked like it was pretty bad at one point before some work was done. 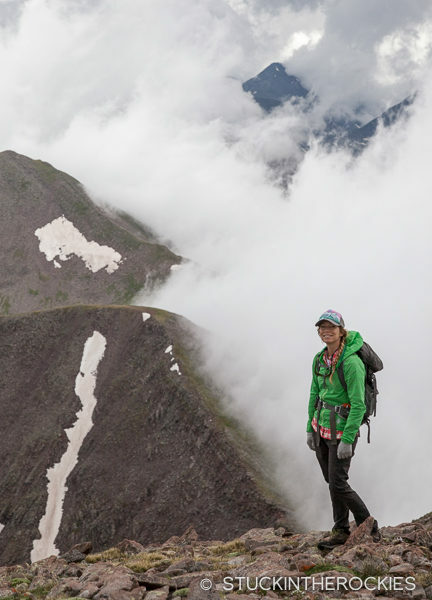 Good for you to try to explore all the valleys, we’ve been doing the same, some as runs, some as backpacks, partly to explore the lakes and trails but also to tag all the summits if possible. It’s a fun place. We just drove by what looked to be a huge wild fire on in the Hayden Pass area, by Coaldale, east side. Hope they get that under control.